Festivals are common all over the world, and they come in different forms, so to speak. Year after year, numerous festivals are held worldwide in order to celebrate or give honor to something. Some festivals are held for a religious purpose, some cultural, and some for other reasons as well. Festivals commonly involve parades, street dancing, various activities, and lots of food. You can also see concert ticket templates. As mentioned, various activities take place during festivals, and some of these come with an entrance fee which something that’s not really uncommon among events. When fees are involved during these kinds of events and activities, there will also be tickets designs that act as the receipt or the admission tool. But even so, tickets can still be used for events that are free for everybody, and we will be explaining that in a bit. 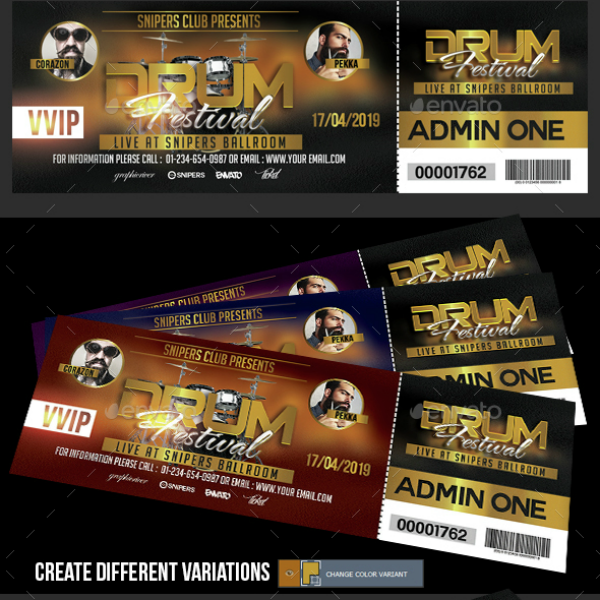 In relation to that, if you’re planning to host a festival event, then we have got the templates that can greatly assist you in making your festival tickets. 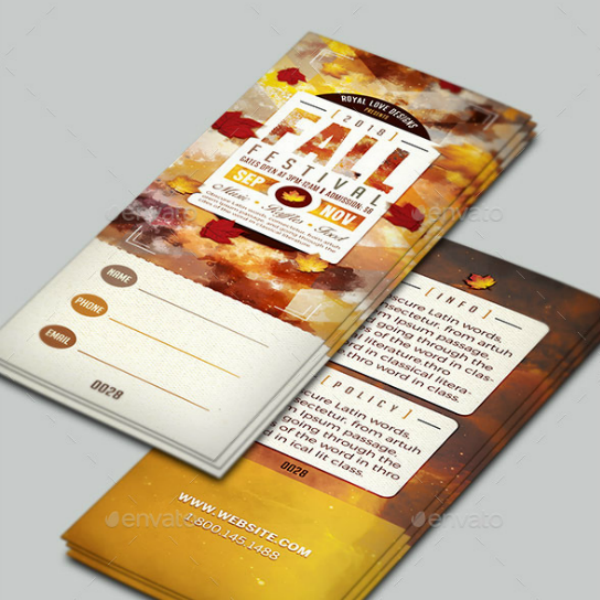 Below is a collection of various festival event ticket designs and templates that you can download and use. These templates were gathered from various websites to save you the effort. All you need to do now is scroll down and choose a template that you wish to use. To quote a line from a highly popular television show, “Winter is Coming”, which is actually true considering that in a few months, the Christmas season will begin. 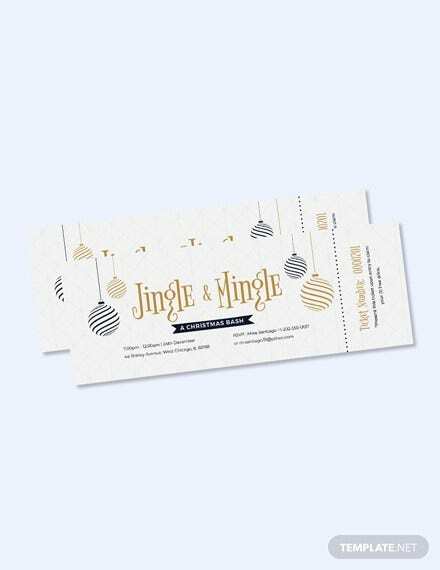 If you’ve been planning to host a Christmas festival, now would be a good time to start preparing what you need for that event, and one thing that you will need to prepare are tickets for the attendees. You are welcome to download and use the ticket template above for your planned festival event. The autumn season has just recently started and we’ll be seeing the leaves on the trees change color and fall off from their branches. While this is not something that people all over the world can witness, it is indeed something that’s worth witnessing. During the autumn season, various events take place such as Halloween party, All Saints and All Souls days, and Thanksgiving. 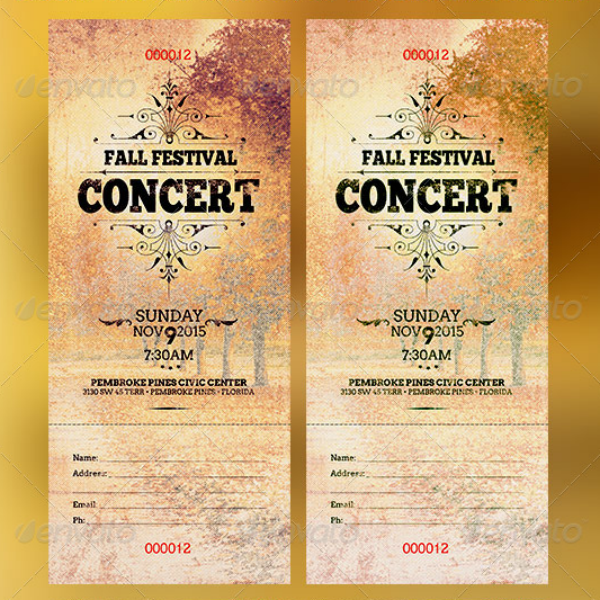 Also, if you wish to hold a different kind of event—a festival perhaps—during this season, then you might want to use the ticket template shown above. A festival is described as an event that is celebrated by and within a community, although most festivals are also being attended by people outside that community. Festivals commonly center on certain aspects of that community and its culture or religion. Oftentimes, festivals are being treated as a local or national holiday. As mentioned during the introduction, festivals serve a purpose—usually communal—and is often in regard to thanksgiving, honoring, or commemorating. You can also check raffle ticket templates. For the term “festival”, it was originally used as an adjective during the late 14th century, and was derived from a Latin term via Old French. The term “feast” was first used as a noun in the 1200’s, and as a verb—the act of eating sumptuously—sometime in the 1300’s. Feast was also used to refer to a large or elaborate meal. The first recorded occurrence when the term was used as a noun was in 1589, but it was still called “Festifall” during the time. In many countries that were once a colony of Spain, the Spanish term “fiesta” is used to refer to a communal religious feast to honor a patron saint. 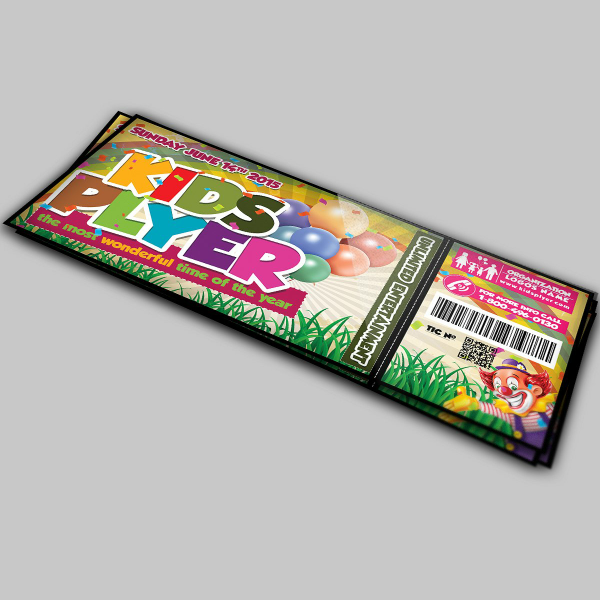 You can also like movie ticket templates. A harvest festival—such as the one shown on the template above—is defined as a yearly celebration that takes place during the time of the main harvest of a certain region. Considering the different climates, weathers, and group of crops across the globe, harvest festivals are being celebrated at different times of the year. During harvest festivals, they usually involve feasting with foods that are made from the crops that were being harvested. Common features of harvest festivals include eating, contests, music, and merrymaking. 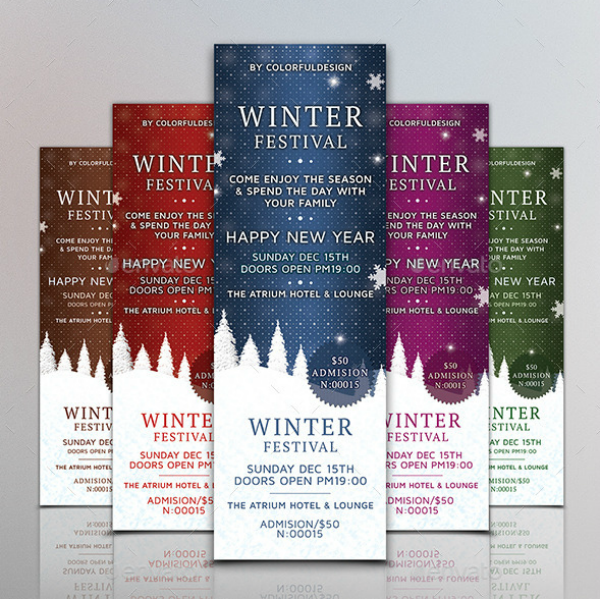 You may also read banquet ticket templates. 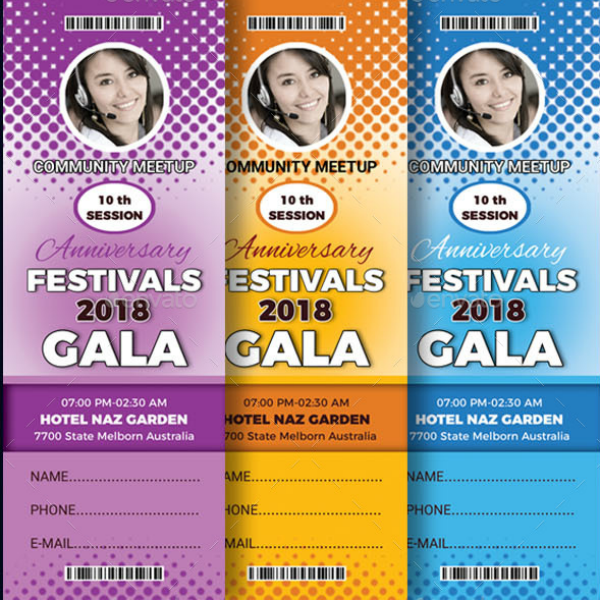 What we have here is a simple yet modern gala festival ticket template in PSD format. As with other templates in this collection, this one is fully editable but only if you use Adobe Photoshop for editing it. 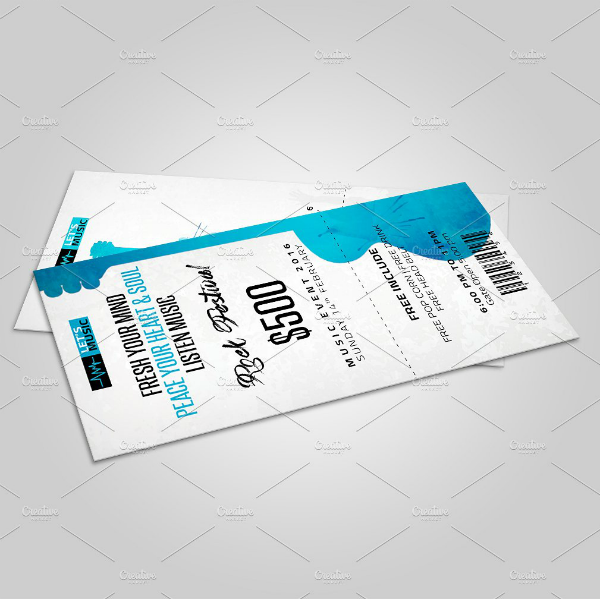 This ticket template also comes in three different colors that you can choose from. 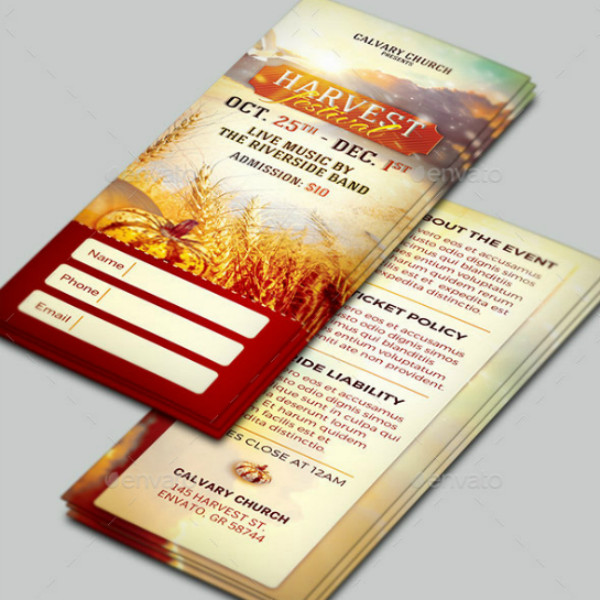 If you like this template, then you might also want to check out our collection of ticket templates intended for church gala events. As mentioned earlier, music festivals fall under the arts festivals, and a lot of people are actually into arts in one way or another. In the same manner, we already know that people enjoy music, but that certain people are fans of a specific genre that may or may not be the same as others. 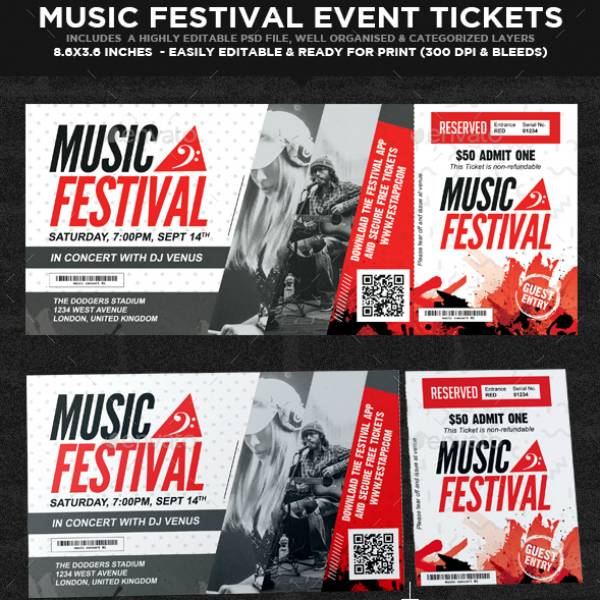 If you’re organizing a music festival, then you might want to use this versatile and fully editable music ticket template, it comes with free fonts and will also allow you to add two photos on the design. What Are the Types of Festivals? Festivals have either religious or cultural origins, though many others have incorporated both religion and culture in the celebration. Considered as one of the most important festivals, Christmas also serves as a culmination of a year. For others, they also celebrate harvest festivals when the season changes. There are even festivals celebrating historical events, such as military victories, a nation’s independence, or any event that help build and strengthen a nation. Without further ado, here is a list of some of the most common types of festivals. 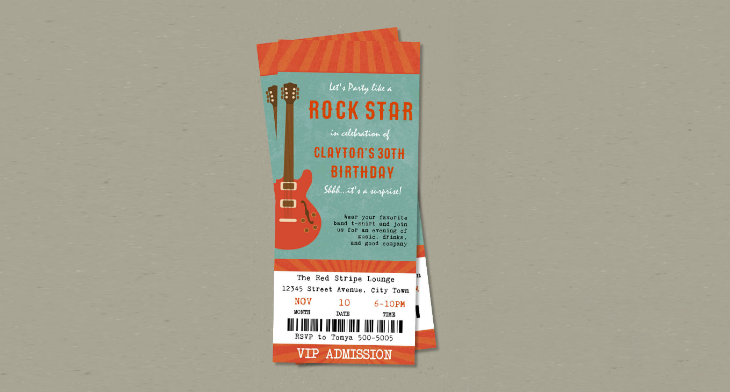 You may also like luncheon ticket templates. In many religions, a feast is a celebration to honor God, and they are held annually. While many festivals have a fixed date, some are also changeable including Easter, Eid al-Adha, and Passover, because these are determined by the cycle of agriculture, the moon, or the type of calendar being used at the time. In Christianity, there are two very important festivals such as Christmas and Easter. For the other religions, the Buddhists have the Esala Perahera, the Hindus have the ancient Holi festival, and the Sikhs celebrate the Vaisakhi festival. You may also see meal ticket templates. Other than the general arts festivals that are being celebrated, there are also the more specific types of festivals that cover certain fields in arts and sciences. These include the science festivals, music festivals, and the literary festivals. Under these are subcategories which include the rock music festivals, jazz festivals, poetry festivals, and the theater festivals. Also under the arts festivals are the film festivals that involve screenings of several films, and film festivals are usually held every year. These types of festivals are basically events that celebrate food and drinks, or a certain specific fruit, dish, or beverage. Some of the most common ones in the world include the National Peanut Festival in the United States, the International Oyster ticket designs in Ireland, and the Oktoberfest in Germany. Because of the nature of these festivals, their dates are movable, meaning the date of the celebration for this year may or may not be the same as next year’s. Many seasonal festivals rely on the pattern of the seasons as well as the solar and lunar calendars to determine their dates. One of the most common seasonal festivals, the Chinese New Year, is celebrated from the day of the second new moon after the winter solstice. Another is St. Johns Day—otherwise known as the Midsummer—is both a feast day of a Christian saint and a celebration of the time of the summer solstice in the northern hemisphere. You may also check baseball ticket templates. Earlier in one of our templates, we discussed what a harvest festival is, when it is usually celebrated, and the common features that occur during the event. 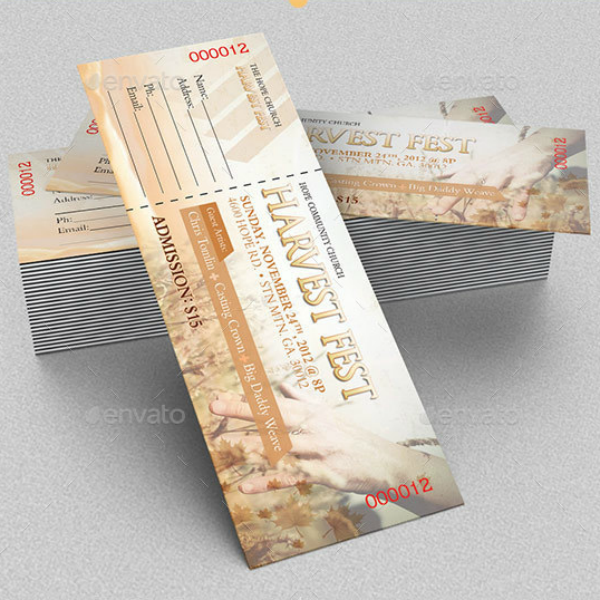 This time, we will be showing you another harvest festival ticket template that you can download and use if you are planning to host one. And if you can remember, the previous template went for a vertical orientation for its layout, this template uses a horizontal or landscape orientation and the design on it is a lot minimal. Now that you have gotten this far, we assume that you have seen every single design in our collection of festival ticket templates. While telling you how awesome they look is not convincing enough, we will do it in a way that will really get you to download a template, starting with the quality of these templates. 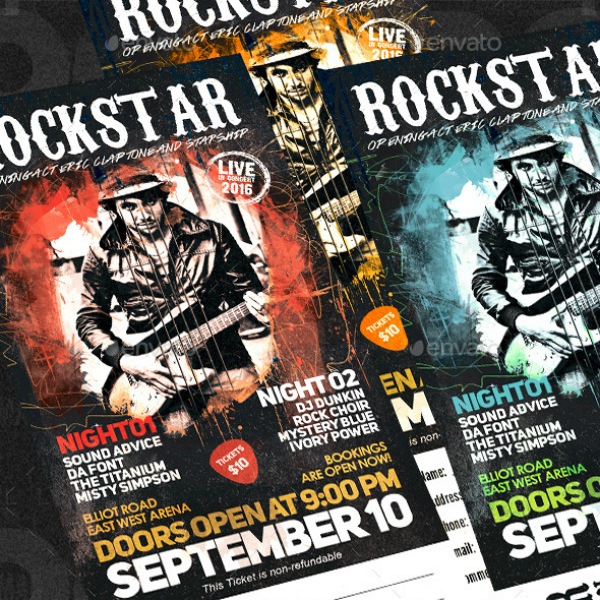 For one thing, these multipurpose ticket templates have a exceptionally high resolution and uses a wide range of vibrant colors. 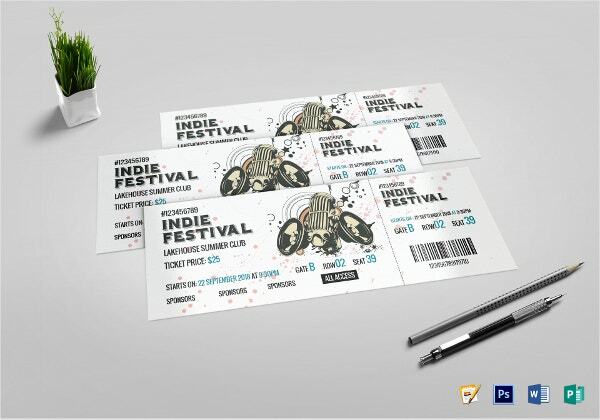 In terms of who made them, these templates were created by professional graphic artists who are knowledgeable and creative enough to make such stunning ticket designs and templates. 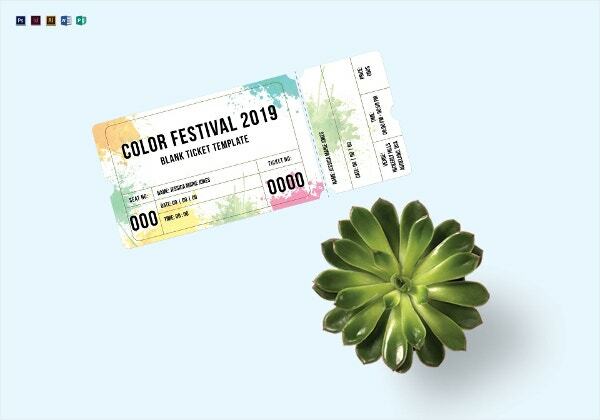 Not only are these artists talented enough to come up with these magnificent ticket designs, but they are also aware of what elements are relevant for each type of festival ticket. This way, you won’t have to worry about missing out on important details for you tickets. 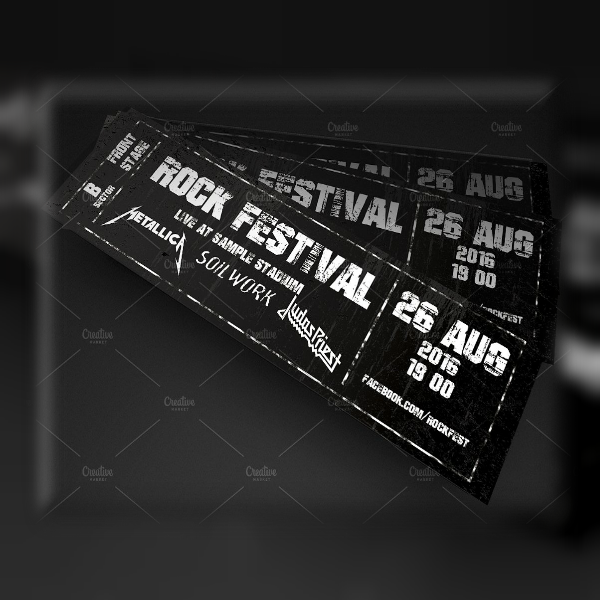 With regards to the functionality of these stunning ticket templates, they can actually be edited quite easily as long as you use the appropriate editing tool. The great thing about these templates is that it will even allow you to edit each element individually. That said, you might think that these templates will cost you a lot, but they are actually quite inexpensive. Do those details make you want to download a template now? If they do, go ahead and do so.